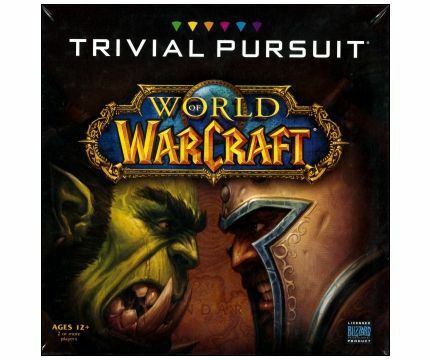 For the first time ever, Trivial Pursuit partners with the massive multiplayer online role-playing fame: World of Warcraft. Challenge and test yourself with 600 questions of the world, dungeons, villains, loot and more. An epic adventure awaits all heroes who answer the call. 100 trivia cards with 600 questions covering six categories: Geography (Locations), Player Characters, Lore, Loot (Items), Enemies, and Encounters. Roll the die and move the number of spaces indicated to determine the category question. If the question is answered correctly, the player may take another turn. Players must answer a question correctly on a wedge space to get a scoring wedge from that category.